If you have a Konica Minolta Magicolor 2450 then you’ll know how easy and convenient the Magicolor 2450 is to use. The Konica Minolta Magicolor 2450 can print up to 20 black and white pages per minute which makes the Konica Minolta Magicolor 2450 incredibly useful for busy environments. Steady use of the Konica Minolta Magicolor 2450 can lead to an alarmingly pricey bill, however, because the Konica Minolta Magicolor 2450 needs a few Konica Minolta Magicolor 2450 cartridges to function normally, like the black Konica Minolta Magicolor 2450 toner cartridge. There are plenty of Konica Minolta Magicolor 2450 suppliers who’ll overcharge you for Magicolor 2450 ink but we at CartridgeSAVE want you to get the Konica Minolta Magicolor 2450 cartridges that you need without being overcharged, so we sell our Konica Minolta Magicolor 2450 ink cartridges at amazing discount prices! Letting you use the Konica Minolta Magicolor 2450 for an extended period of time while paying less is what we’re all about, so we offer the Konica Minolta Magicolor 2450 toner with great service as well so you get the best value for money. We send the Konica Minolta Magicolor 2450 cartridge to you by means of free delivery in order to allow you to get your new Magicolor 2450 toner without having to pay any additional fees. We also send the Konica Minolta Magicolor 2450 toner cartridge off with a money back guarantee so that you can get your new Konica Minolta Magicolor 2450 cartridge and not have to worry about any malfunctions or unsatisfactory performances. For direct printing from cameras, the Konica Minolta Magicolor 2450 is one of the few laser printers that offer a built-in PictBridge port. The Magicolor 2450 laser printer delivers accurate colour on output from black and white text to coloured graphics and even photos. Print resolution can go as high as 9600 x 600 dpi. The Konica Minolta Magicolor 2450 is a bit noisy, however, and print speed for coloured prints is rather slow at 5 ppm. The Konica Minolta Magicolor 2450 colour laser printer has an output tray on top, along with a small control panel that also has a monochrome LCD display. The paper tray can handle 200 sheets at a time. For connectivity, there is a USB port and Ethernet. The Konica Minolta Magicolor 2450 printer can be shared in workgroups as it has built-in Ethernet. It can be used for Macintosh and Windows operating systems. Printing high-quality photos form cameras is easy, as the Minolta Magicolor 2450 has a PictBridge socket. 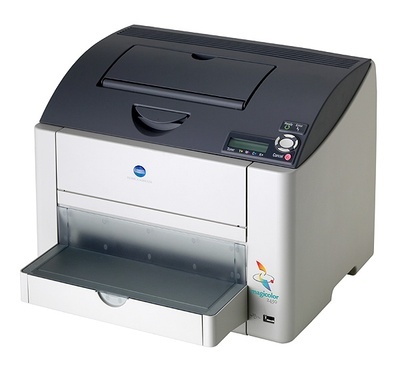 The Konica Minolta 2450 printer is also cheap for a laser printer that has these connectivity features. Unlike other laser printers, the Konica Minolta Magicolor 2450 is rather slow in printing coloured print jobs. The Magicolor 2450 colour printer could have been better if it had built-in Wi-Fi and if it wasn't so noisy.